Regional publisher Local World has launched an ambitious bid to reinvent late final editions by publishing them in mobile and tablet format. Free downloadable apps will deliver a news digest of the days biggest stories to Android mobile and tablet handsets each workday at 5pm. Local World says the apps will select the “most social, snackable and shareable stories” from the News, Sport, Galleries and What’s On categories of its daily editions, plus the day’s biggest news from each local area. 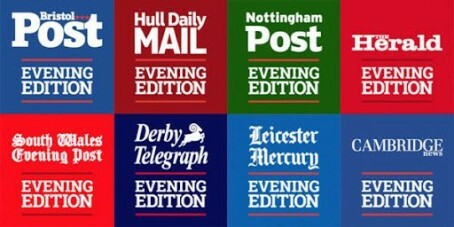 The first wave of titles to publish the new apps are the Bristol Post, Cambridge News, Derby Telegraph, Gloucestershire Echo, Hull Daily Mail, Leicester Mercury, Nottingham Post, South Wales Evening Post, The Sentinel, Stoke, and The Herald, Plymouth. Aimed at homebound commuters, the apps will also use Local World’s audience analytics software to help shape the best possible content to the evening audience. 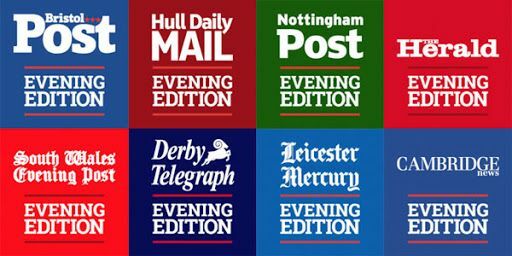 Matt Kelly, group digital director said: “So many readers and journalists grew up with the evening edition of their local paper being the pulse of their city. The project has been launched in close collaboration with the GooglePlay store, and according to LW, marks its progress in innovating and adapting to the demand for online local content. The apps can be downloaded from GooglePlay here. Can someone please quantify “the demand for online local content”? And then can someone explain how meeting that demand in this fashion generates profit? And how many staff would be employed on the operation – and what would be their core skills – utilising part of that profit? These are not wind-up statements, genuine questions. Thanks in advance for any answers. Why not just put the news online? That’s quite up-to-date, isn’t it? On one hand, Local World wants it’s own mobile-friendly website to contain rolling updates on the latest local news and to not have the same stories throughout the day. On the other, it wants people to download an app to get a mix of the day’s stories. Commercially, I see the opportunities in some of the trial centres mentioned above but it will require some heavy promotion and marketing to start having any long-term effect. However, I can’t see this ever working in smaller patches where it’s hard enough to get a handful of new, interesting stories a day let alone a round-up! Apps are always going to be a major barrier with news. People only ever use a handful of apps regularly and are often quite brutal about deleting something they’ve not used in a while. These will have to be good from day one or, even in areas where they have a chance of working, they’ll fail. I honestly hope they work though! It’s an interesting trial. Sorry about the it’s. Autocorrect strikes again! Lovely, more free news and another reason not to buy the paper. Suits me though, a quick digest of what’s what in my town while I’m travelling home. How will this pay for itself? Online is not that up-to-date Dave. Hi – I’m the digital director on this project and can pick up some of the points here. We hope these apps will complement all of our other platforms, which all have different places in the lives of our readers, including f course the newspapers. The content is a digest of the best strories produced through the day in our newsrooms, so its not really any extra burden on the reporters – but I hope the readers will enjoy the experience in the app and appreciate the editing. Commercially, like any product we produce, we hope to attract a strong local audience that will appeal to local advertisers. I hope the idea of a 5pm weekday edition will stick in people’s minds and will inform and entertain them on their commute back from work. It’s a fairly simple concept and it’s been great to have Google supporting us. We don’t know if it will work in smaller towns and communities but will play it by ear and continue to experiment and innovate with our readers and advertisers front of mind. Did Local World just have a good idea involving efficient and innovative use of journalism in their marketplaces? I think they probably did. We’d all been wondering when something useful might come out of all those sharp suits in Kensington with ‘content’ somewhere in their job title. Congrats chaps, crack open another organic smoothie by way of celebration. I call JARGON BINGO! for the full house. In all seriousness, any new idea is to be welcomed, but don’t dress it up in stupid terms like this. Let’s also hope the advertising systems which make Local World websites unusable on most mobile devices aren’t involved in this project in any way. Might work in larger towns. Forget the rest. Even cynics can recognise a good idea when they see one. Hope this works and they find a way to monetise it so investments can be ploughed back into newsrooms not boardrooms. How will this pay for itself asks ‘ they think it’s all over’.? face’ and completely over the top. Try sorting out your websites, make them more user friendly first before you come up with yet another crackpot idea.! um, this is surprisingly good. well done! Take a look at that comments section of any Local World website, or their social media feeds, and they are full of angry consumers who are turned off completely by the proliferation of intrusive ads when attempting to view pages on the sites. Does Matt Kelly take overall responsibility for this trashing of his teams’ journalism or not? If he does then only a change to this policy will see him ever being taken seriously on initiatives like this. If he isn’t, then I am afraid the money-grabbing, short term merchants continue to win the day, damaging any hope of credibility and brand building along the way. To echo Industry Analyst, the first paper I ever worked for is currently owned by LW. I sometimes look at its website but it is always an excruciating ordeal because of the number of ads. However, I am sure the big cheeses at LW are well aware of this and, frankly, don’t care. Their logic is probably that, in an industry whose future is so uncertain, is there any point trying to, as IA says, build a brand? Just grab the money while you can. What in God’s name is a ‘snackable’ story? What does the word even mean?